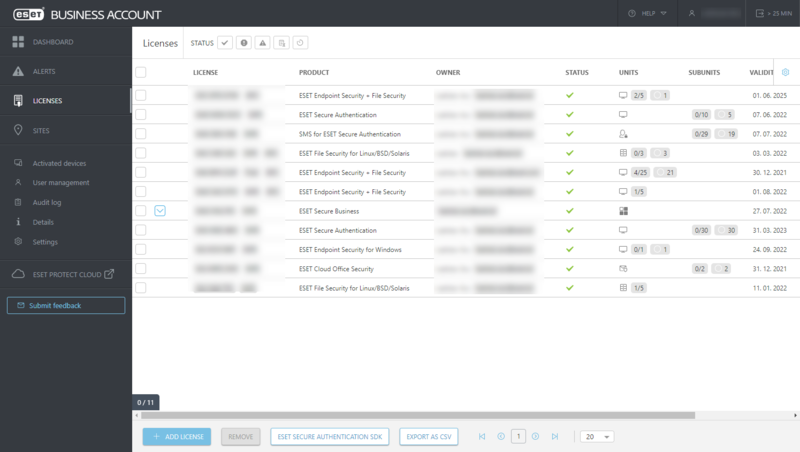 The Licenses screen displays all business licenses imported to your ESET Business Account portal. — The license is valid. — The license is about to expire, or action is required for you to continue using it. — The license is overused or expired, or action is required for you to continue using it. — The license is suspended. •Overview—basic details of the license, including license key. •Activated devices—list of devices where an ESET security product has been activated by the particular license. Allows you to deactivate license on displayed devices. •Offline files—generate and view already generated offline license files for the particular license. An offline license file is meant to be used only on computers that are never supposed to be connected to the internet.